KLIM proudly creates the most technically advanced riding gear in the world. By listening to our core-customers' needs, utilizing unmatched innovation and service, leading with superior product knowledge, and constantly striving for excellence, our team delivers uncompromised quality in every product we sell and how we service that product after the sale. KLIM continually pushes to enhance every riding experience under all conditions. That's more than hype, it's our Technical Reality. KLIM officially began as a brand in 1999 when we introduced our backcountry gear manufacturing experience and advanced material technologies to the snowmobile market. Snowmobiling, inherently, introduces tremendous stress on human comfort factors (moisture, temperatures, heat, wind, etc.) By mastering the elements through superior design, materials and construction quality and educating enthusiasts on how to properly dress for conditions and exertion, KLIM quickly became the premium brand of choice for snow riders across the globe. Why snowmobiling? Because that's what we do in the winter around here. We realized the snowmobile gear market was sub-par so we went out to re-set the standards of quality and comfort on the snow. When you live in Idaho, getting outdoors in the winter on a machine is simply awesome. Just like adventure motorcycle trips take to you places you'd never see otherwise, snowmobiling takes you to another planet in the winter. 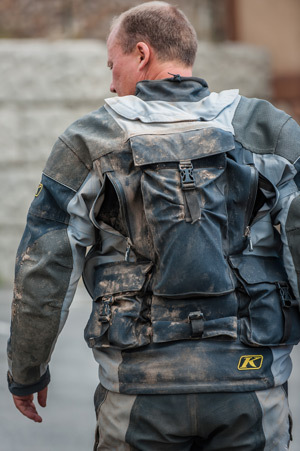 KLIM's background in motorcycle gear naturally started with our off-road products. After all, that's what we do in the summer around here. With our history of listening to riders' needs and addressing them in fanatically functional garments, our off-road gear instantly resonated with real riders. Just like our snowmobiling employees (company founders) and customers wanted gear that helped them enjoy riding in extreme conditions, our off-road crusaders wanted tougher pants and jerseys, more intelligent ventilation systems, efficient cargo options and a look that said, "I'm a rider." The Adventure gear evolution began with Jonah Street and the Dakar Rally. He needed a jacket that could contain all of his needs for grueling stages across Africa, adapt to drastically changing weather conditions, and fit properly to conserve energy and eliminate discomfort. We experimented with modified jackets and custom one-off pieces. We had him racing and riding in a lot of different combinations (still do). Quickly, it became clear that we needed to develop adventure market gear to fill the gaps in functionality and quality for racers like Jonah and for our customers who were already dual-sporting and taking extended trips in our off-road product. KLIM's UK distributor, Adventure-Spec, had some great ideas for products and a core group of dedicated Adventure Touring freaks over there really kick-started our efforts. 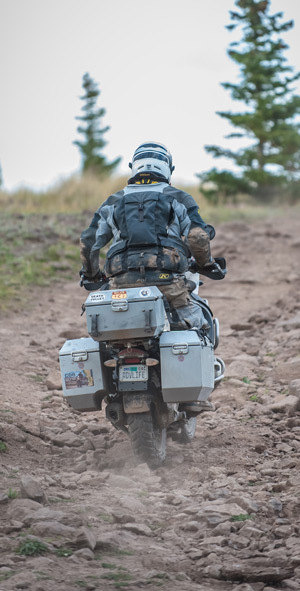 We used their passion and experience to help us drive the development of the KLIM Adventure Rally Jacket and Pant. That product alone re-set the standard for premium adventure-class gear. It was and still is ahead of its time. We've done a complete redesign on the Adventure Rally once already—taking immediate customer feedback and once again putting it right back into the product. We're talking about a turnaround time of less than two years, on the most advanced piece of motorcycle gear. KLIM Adventure-class started with the Adventure Rally. If you look at our product lineup before the Badlands and Latitude are released last year, there was a large gap between our enduro/off-road pieces and the top-of-the-heap Adventure Rally. On one end is the Traverse—a dedicated, off-road engineered GORE-TEX® waterproof riding jacket and pant set. It doesn't have integrated armor (although it does have padding pockets in place for those that want to upgrade) and it's really cut and fits like an enduro piece. Minimal cargo-capacity, less intense fabric combinations, etc. KLIM's Badlands Pro and Latitude pieces fill the space between our Traverse piece and our Adventure Rally piece perfectly. And, they allow buyers more options to experience the incredibly improved ride KLIM gear has been delivering on the snow and single-track for years. Both pieces offer full CE armor, smart pockets, highly effective ventilation, road-smart fitment and fabrics, impressive reflective real estate, and more. Today KLIM continues to expand into the motorcycle market the pattern of our success remains the same. From our innovative truly ventilated helmet to new gloves and base and mid-layers, we are excited to exceed expectations. We use the products we make. We create products that work; products that enhance our experiences in extreme conditions; products that stand apart as supremely different; products that inspire confidence every time we use them. We build KLIM so you can trust KLIM.